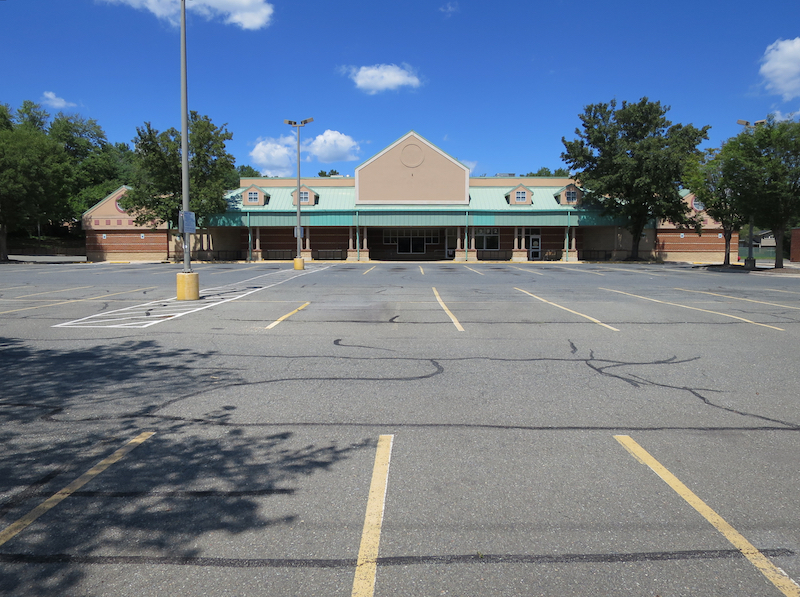 Former Safeway grocery store in the Twinbrook Shopping Center. The new and larger 24-hour Safeway store that opened in December on Rockville Pike near the Twinbrook Metro in Rockville is having a domino effect on other businesses in the area. When it opened, it made the Safeway in the Twinbrook Shopping Center at 2200 Viers Mills Road redundant, so it closed a couple months ago and left another empty store in the shopping center. Recent rumors suggest that it soon be filled by Lotte Mart, a South Korean market chain with more than 200 stores worldwide, including Gaithersburg and Wheaton, but its arrival won’t be welcomed by everyone—the nearby small Asian Market will close, leaving another hole in the shopping center. As the owner of Asian Market explained, “between the increased rent and the new competition [Lotte Mart], I can’t stay in business. It’s already hard enough to make a profit while working 16 hour days, so I’ll be closing at the end of August and looking for a job working for someone else.” Although it’s small store with just three aisles, it represented a wide range of culinary cultures, including Chinese, Thai, Japanese, Cambodian, Korean, Philipino, and Indonesian, that are not typically found in the larger Lotte Mart or Great Wall. To clear out its inventory, it is selling its bottled, canned, and dry goods (except rice) at a 20 percent discount. The soy sauce and sambals are all gone, but there still was plenty of Thai curry, coconut milk, and noodles on the shelves when I visited a couple days ago. The former Safeway store, just like the Twinbrook Library, is on a parcel that is owned separately from the rest of the shopping center but serve as anchors that attract customers. The building is almost twenty years old but still serviceable, but too small for today’s major grocery, department, or hardware stores. An Asian or Hispanic grocery store seems to be the most likely candidate, especially with the demographics of the neighborhood, and when it comes in, it too will have a domino effect on the rest of the shopping center. Whether it will be good or bad remains to be seen. It’s pushed one business out but could attract others—and it badly needs to fill the half dozen stores that are empty. A new Safeway grocery store opened this past week at 1800 Rockville Pike across the street from the Twinbrook Metro and part of the Galvan at Twinbrook Apartments. It will soon be joined by Smashburger, Shobha (hair salon), Floyd’s 99 Barbershop, Dunkin Donuts, Pie 360 (pizza), Capriotti’s Sandwich Shop, and Ethan Allen. The new Safeway enriches a corridor of grocery stores within a half-mile of each other, including Fresh Market, Trader Joe’s, Target, Giant, and My Organic Market (MOM). On-street parking is limited and metered (free on weekends) so most people will prefer parking in the underground garage via Bouic Avenue, where the first two hours are free (this location is adjacent to Metro, so nearby parking is always restrictive). There’s another entrance for underground parking on Chapman, but that’s for the apartment residents. open 24-hours every day. Security guards were posted at the entrance and in the garage this morning; not sure if this is temporary or permanent. a new layout with fresh produce along the entire front of the store. I understand they want to have the fresh stuff up front but it’s not an efficient circulation pattern for customers. special sections for Kosher, gluten-free, and organic foods. A Kosher Chocolate Factory will be at the store on Sunday, December 13 at 3:30 p.m., suggesting they may be offering special events throughout the year. bulk sale of nuts, seeds, grains, and more. Available loose so you can buy as much or little as you need. some aisles, particularly those with small items like medicines, have lighting on individual shelves to increase visibility. a room with tables and chairs near the entrance for customers to talk over coffee or use wifi. Not sure why it’s called the Hungerford Room–it’s no where near Hungerford. Halpine, Montrose, or Twinbrook would have been more appropriate. a Team Room selling shirts, mugs, and souvenirs from local professional sport teams. no beer or wine sales, due to the crazy restrictions of Montgomery County. 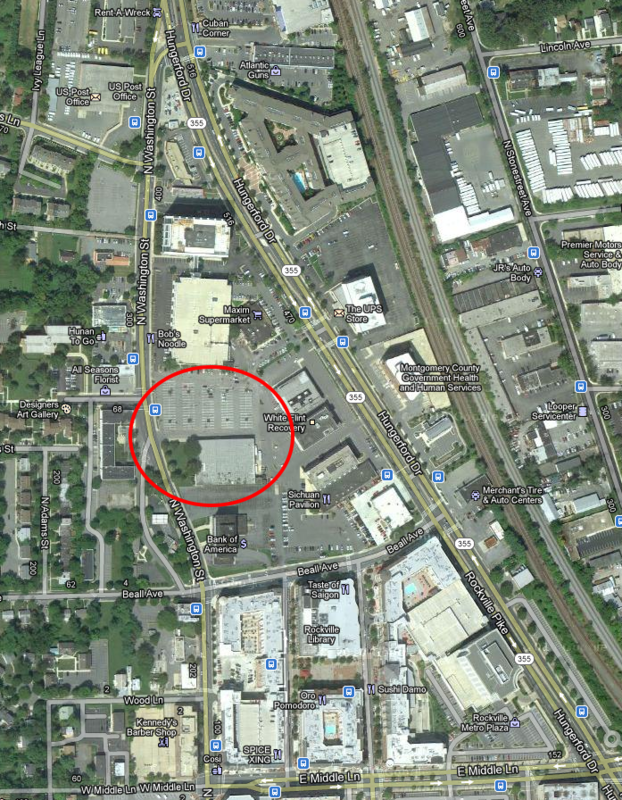 You’ll have to go to Olney if you want to buy beer and wine in a Safeway. It seems that the half of the employees have been re-assigned from other Safeway stores and the rest are new. And while this Safeway store has just opened, the store on Randolph Road and Parklawn recently closed and the one on Veirs Mill in Twinbrook will close soon. Tony Greenberg of JBG describing plans for downtown Rockville. 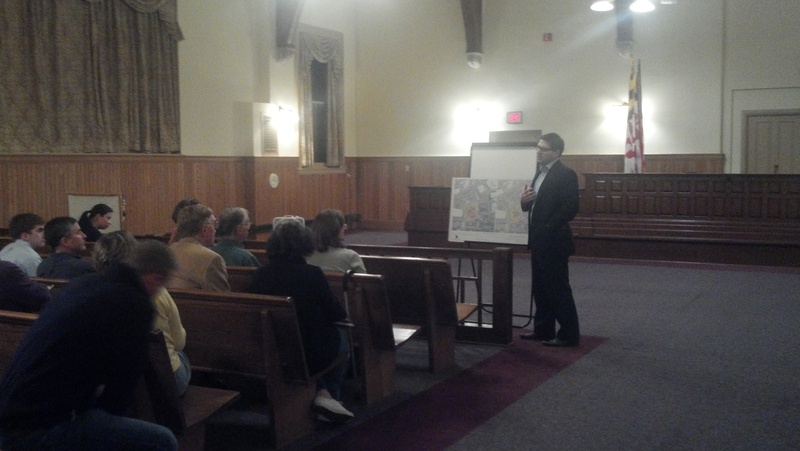 About two dozen people gathered in the Red Brick Courthouse last night to hear Tony Greenberg of JBG Companies of Chevy Chase discuss conceptual plans for a three-acre lot in downtown Rockville, the site of the former Giant grocery store on Washington Street near Beall Avenue. The Town Center Action Team hosted the meeting and among those attending were councilmember Bridget Newton and chief of planning Jim Wasilak. JBG is one of the region’s major developers and is currently building the Alaire and rehabilitating the million-square-foot Health and Human Services Building in Twinbrook. Greenberg noted that JBG Rosenfeld is an affiliated but separate company that specializes in managing retail properties (such as the Twinbrook Shopping Center). JBG’s focus is primarily planning and construction of offices, hotels, and mixed use projects (i.e., retail AND residential, such as the North Bethesda Market which combines a Whole Foods Market and 400 apartments). Old Giant Store Site in downtown Rockville. The Old Giant site has been vacant for years and is receiving very little revenue (mostly leases for parking). It’s part of the next phase of development for the Town Center (aka Town Center 2) and although currently sited mid-block along Washington Avenue, the City’s plans include streets bordering two other sides of the three-acre lot (an extension of Maryland Avenue from Town Center and a new Dawson Street linking Washington and Hungerford). JBG’s current conceptual plans include those streets as planned (although adjustments have been discussed to avoid awkward leftover parcels) and how their project might relate to the adjacent properties as Town Center 2 is developed. Greenberg noted that adjacent properties are separate parcels owned by others, such as the Maxim supermarket and the fire station, some of whom are not interested in selling because they want to develop the property themselves. Plans for relocating the fire station have died down, development of the Bank of America parcel have been scrapped due to the economy, but a Walgreen’s drug store is underway along Hungerford. 3. What would you do to help the King Farm Village Center thrive? Would you allow more signage on nearby streets and roads?